The annual Giant Pumpkin Festival takes place over the weekend of 8-9 March 2019 in Heidelberg. In 2016 a Mountain Bike Race was added and because of it’s success – we are repeating this in 2019 – Bigger and Better! This will take place on Saturday 9 March 2019. For 2019, we added a 100km Mini-Fondo, a 60 km Cycle Race, 40 km Cycle Race and a 15 km Fun Cycle Race. Gravel Bikes and MTB welcome. Enter online, or on Friday evening from 17h00 onwards or on the day from 06h00 – 07h00. 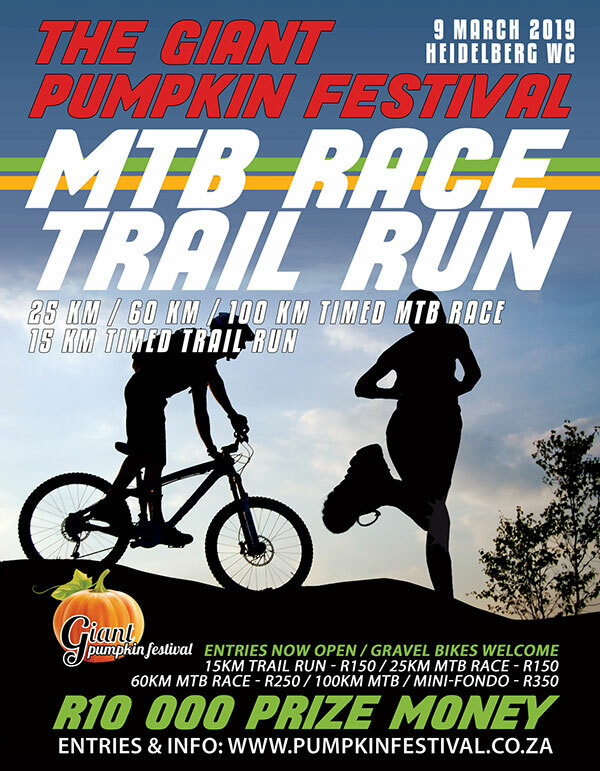 There will also be a 15km Trail Run.